They are one of the most ESSENTIAL components, or foundations of Thai cuisine; Pastes form the base of many dishes, from soups, to curries, to stir fries. 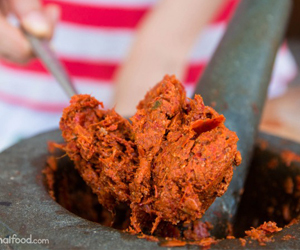 There are many different types of Thai curry paste blends, but in this recipe, we’ll be making Thai red curry paste (in Thai it’s called prik gaeng ped). 8 dry red spur chiles. 3 teaspoons white pepper corns. 1/2 teaspoon jeera powder (also known as cumin powder). 10 – 15 cloves garlic. 1 tablespoon fresh coriander roots. 1/2 the peel of 1 kaffir lime. For the first part of this Thai red curry paste recipe, it’s best to keep your dry and wet ingredients separate at first. The first thing I did was pound 3 teaspoons of white peppercorns until they turned to powder (about 5 minutes) and then added 1/2 teaspoon of cumin powder and 1/2 teaspoon of coriander powder. Once the dry spices are ready, empty them out of the mortar and set them aside in a small bowl (now, we won’t use them until the end). For the dry red spur chillies (prik haeng met yai), you want to first soak them in water for 10 – 15 minutes to soften them up, and then drain them. I used 8 big chilies, and cut them into 1 centimeter pieces, and added them to the mortar along with 1/2 teaspoon of salt. It’s best to first pound the chilies and salt until quite fine and the oils are fully released from the chilies (about 5 – 10 minutes). Pounding the paste by hand will take some time, patience, and elbow grease, but the end result is so worth it. It took me about 15 – 20 minutes until all the ingredients were fully pounded into a paste. You’re looking for a buttery oily consistency with no chunks. It should almost look like a tomato sauce. When you’ve got a nice paste, then you can add in 1/2 teaspoon of shrimp paste, which is going to add some saltiness to your Thai red curry paste. The final step is to go back to your dry spices and mix in your bowl of white pepper which is already mixed with cumin and coriander powder. Your red curry paste will turn a little less deep red and more of an orangey red in color due the white colored pepper and spices. Make sure everything is pounded out and mixed all the way through.